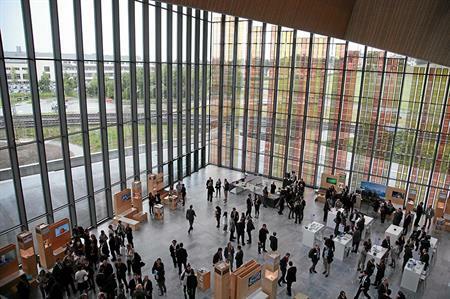 The International & European Associations Congress (ACIE 15) has opened at the SwissTech Convention Center in Lausanne this morning (6 May). Representatives from 210 associations across the globe were welcomed by congress chairman and executive director of Associations Network Damian Hutt. They have already enjoyed speeches from Jean-Yves Pidoux, Lausanne City politician and director of industrial services, and Andre Schneider, vice president of the EPFL University. Panos Tzivanidis, head of events and hospitality at the International Olympic Committee also gave a keynote speech titled Forming the Foundations for International Success. The event, which concludes tomorrow (7 May) features 130 exhibitors including ACC Liverpool and London & Partners. Guests gathered for a pre-congress drinks reception at the Olympic Museum last night (5 May) and will attend a hosted dinner this evening. Lausanne is home to more than 70 international sport and other industry associations. Among them are some 60 international sports organisations, including 55 sports associations, plus the International Olympic Committee, making the city one of the primary centres for international association headquarters in Europe.